Acacia Vineyard is known for their Carneros Pinot Noir and Chardonnay so it’s not a stretch to expect them to try their hand at sparking wine. What is a bit surprising is their preference for long bottle age as this wine, now 10 years of age, is still available in some stores (the winery is selling the 1997 vintage right now). I couldn’t find any information about the percentages of the blend but I’d guess from the taste it’s just a tad to the Chardonnay side with the rest being Pinot Noir and perhaps some Pinot Meunier. 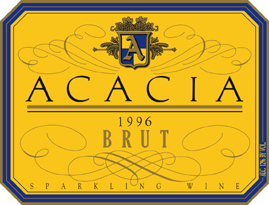 Acacia Vineyard, Brut, Sparkling Wine 1996 ($40) – Golden straw in color with vigorous bubbles. Citrus and fresh bread aromas. Lemon and mineral flavors with a dose of acidity and nuttiness on the finish. Dry and clean but not as complex as expected given it’s age. I’d drink these up if I had any more bottles as I don’t think they will improve. It’s Wednesday and (fairly) early in the month, so it must be time for another edition of Wine Blogging Wednesday. This time out, Culinary Fool is hosting and has chosen the theme of sparkling wine. Avid readers will remember only a couple of months back we sampled Champagne for this event. This month the only rule is the wine has to be sparkling and can’t come from France’s Champagne region. I really like this because December is a very festive month where most sparkling wine is sold and consumed. And, on the occasion I pop a cork of bubbly, 90% of the time it’s from Champagne (the other 10% from California, mostly Roederer Estate). So if the theme is to explore the world of sparkling wine outside of my normal places, I wanted to really think different. I looked for Sekt from Germany or Austria, but couldn’t find a bottle I thought would be a good choice. Then I looked for sparking Shiraz from Oz but didn’t find one example in the stores I visited (I know there is some in town, because I’ve seen it before). So after briefly considering Prosecco, I decided to revisit Cava, the sparkling wine of Spain. Cava and I go way back to my early days of wine geekdom. In fact, right after I graduated from Korbel Brut, there was always a black bottle of Freixenet in reserve at Casa Elliott. This inexpensive sparkler provided many of the same flavors of California wines at a fraction of the price. But like many other wines, my palate developed and only Champagne or higher end California sparklers would do. To make my final choice for this evening, I ventured into Solo Vino and asked for their recommendation. The bottle I ended up with was Cava Avinyo Brut Reserva made by the Esteve Nadal family of Avinyonet del PenedÃƒÆ’Ã‚Â¨s in Spain just outside of Barcelona. This Cava is blend of Macabeu, Parellada, Xarel-lo grown with biodynamic and organic methods (although not certified as such). These three grapes are native to Spain and the only that are legally permitted to be blended into Cava (some producers are now lobbying for Pinot Noir and Chardonnay to also be approved). The wine is made using the mÃƒÆ’Ã‚Â©thode champenoise with 18-22 months of bottle aging before disgorgement. Cava Avinyo, Brut Reserva, Penedes, Spain NV ($14) – Light straw with a green tinge and medium-sized bubbles. Aromas of green apple, grapefruit and the slightest hint of yeastiness. In the mouth, there is the initial impression of citrus and bracing acidity, then nice and dry with some peach on the finish; very fresh and satisfying. A fairly complex sparkler at a bargain price; highly recommended.